I love Joe R. Lansdale. I say that not because he’s created his own martial art and is singularly placed to kill me if I don’t, I think he’s genuinely one of the best writers we have. A man whose touch for character and dialogue is matched only by his ability to crank up tension with every page. 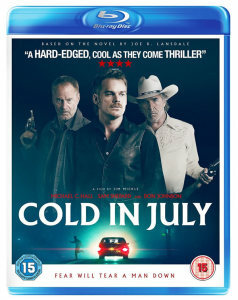 With that in mind, it’s safe to say that I approached COLD IN JULY with a mixture of excitement and concern (when a favourite book is put onscreen it’s all to easy to overthink these things). It’s an excellent adaptation. Mickle and Damici have created an excellent script and how can you go wrong with Hall, Shepard and Johnson as your stars? When picture framer Richard Dane shoots a burglar — pressing the trigger in surprise rather than anger — he sets off on a unpredictable trail that will forever change him. Set in 1989, it’s a noir thriller with a healthy dose of John Carpenter (most particularly in the soundtrack and the title font… yes, I’m a terrible human being, I notice fonts), but where it really succeeds — as is the case with all of Lansdale’s writing — is as a character piece. The plot is excellent but it’s the people we’re in it for, Hall’s gentle Richard Dane, Shepard’s bitter and regretful Russell, Johnson’s flamboyant and charming Jim Bob. These are three men we’d follow into Hell, which is just as well as that’s more or less where we’re going. A superb movie, one of the year’s very best, and if it opens the door to more from Lansdale’s work (a TV series featuring his Hap and Leonard characters is forthcoming from Mickle and Damici) then we’re doubly blessed. 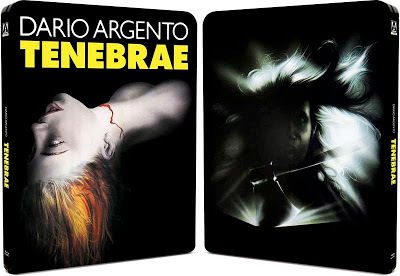 The blu-ray comes with deleted scenes plus a commentary from Mickle, Damici and Hall.